With all eyes on the Gulf of Mexico oil slick catastrophe, it was interesting to talk with the Air Force responders to potential wild fire disasters. 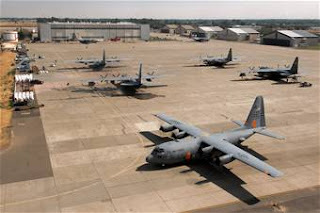 Created in the early 1970s after a major fire in Long Beach, California destroyed hundreds of homes with a civilian fleet of airtankers unable to meet the needs of firefighters, the Modular Airborne FireFighting System (MAFSS) program is a joint effort of the Air Force Reserve and Air National Guard’s C-130s in four airlift wings. I met with Lt Col Brian Allen and Mr. Lynn Ballard, a US Forest Service spokesperson during the Defense Department’s Bloggers Roundtable to learn more about their capabilities for the upcoming fire season. This was training and recertification week at Greenville, SC for the aircrews flying MAFSS missions which prepares them for the upcoming fire season. The training includes the Forest Service and almost 200 flying hours are flown by the C-130 crews from the 146th, 302nd, 145th and 153rd Airlift Wings. This capability is even more critical to the Forest Service recently as their contracted tanker fleet is aging and has gone from 44 tankers to 19 available for the coming season! With a 3,000 gallon tank filled with water and fire retardant the tankers can drop a 60 foot wide strip for a quarter of a mile to protect homes, build a barrier and give the guys/gals on the ground a chance to catch up! The pilots and loadmasters are specifically qualified for this mission and according to Lt Col Allen are among the top 1% of the pilot and loadmaster crewmembers due to the nature of the mission with its low flying hazardous environment. The 14,000 pound MAFSS system is placed on three pallets and can be installed in under 4 hours for a MAFSS II and from 4-6 hours for the 29 year old MAFSS I systems. Currently the units have 8 MAFSS I which will be retired soon and 9 (one spare) MAFFS II. The MAFSS II has improved performance since it allows the aircraft to be pressurized. The older system used the rear ramp to spray and the newer model uses the left paratroop door. With the aircraft pressurized and the ramp up the aircraft can fly faster to get to the fire and higher to get to mountainous locations as well. Able to dispense their 3,000 gallon load of water/fire retardant in under 5 seconds the aircraft bring a fantastic tool to the plan for the fire fighters of the Boise National Interagency Coordination Center. Their norma l response time is 13 hours from the notification call to dispensing their load of retardant. I asked how the wars in Iraq and Afghanistan were impacting the program with its heavily tasked Guardsmen and Reservists and Lt Col Allen said while difficult it had not impacted their response at this time. He mentioned that most of the personnel involved had been recently deployed and had civilian jobs too! Allen said the men and women involved enjoyed the mission as they felt like they were helping to protect the homeland. Mr. Ballard, of the Forest Service described the MAFSS as a “rewarding and beneficial program” and with no crashes or lives lost in the 29 years of the program …testament to the quality’ of those involved! For more information on MAFSS please read this DoD article on their training and if you would like to listen to an audio of the Roundtable or read a transcript please go to DoDLive. A big thank you to the men and women of the MAFSS units for serving America with your capability to fight fires!